Little Common player-manager Russell Eldridge says the football club must strike a balance between attack and defence against title-chasing opposition today (Saturday). The Commoners will host second-placed Newhaven in the Southern Combination League Premier Division. Kick-off at The Oval is 3pm. Eldridge said: “We know what their threats are, but knowing what their threats are and being able to stop them are two different things. “When they’ve got pace up-front you tend to defend that little bit deeper to deny them space in behind, but we’ve got to try and have a little bit of threat (going forward). We will have to try and get the right balance between attack and defence. Nick Richardson is carrying a bit of an ankle injury, but Common should be pretty much at full strength and will be boosted by the signing of defender Ryan Alexander. “He gives us a bit more experience, a physical presence and a few more options as well,” added Eldridge, whose team was beaten three times by Newhaven away from home early on in the season. Common’s match at home to East Preston was postponed less than an hour before kick-off for the second time on Tuesday night. The game was called-off due to a waterlogged pitch having been postponed for the same reason at the first time of asking on Saturday December 15. It meant a second wasted journey across the county for East Preston, although several of their players were running late in any case following delays on the A27. Eldridge said: “When we arrived at 6.30pm there was quite a bit of surface water on the pitch. “The referee said he would have a look in 20 minutes and he came to the conclusion that if we started we might not finish so therefore the game was postponed. 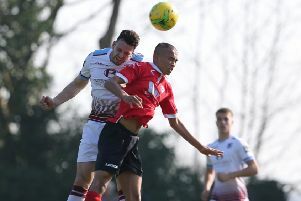 Common were beaten 3-0 away to fifth-placed Broadbridge Heath last weekend as they failed to build on their encouraging 2-2 draw at Pagham seven days previously. “As well as we performed at Pagham, we’re unable to put together back-to-back performances to try to get back-to-back results,” continued Eldridge. Common are fourth-from-bottom of the table and just a point above the two relegation places, albeit having played less matches than any other team in the bottom seven. Common have picked up just four points (all draws) from their last 11 league encounters, with their last win at Arundel in late October.